Today marks the start of the first full work week since vacation. It's always hard getting back into the groove of things but a Grande Misto and lunch plans always make it easier to get through the day. This pink suit doesn't hurt either ;) A stretchable linen fabric from RW&CO, I adore the shade and the wide leg pant style. True - this isn't my uniform on a day to day basis at the office but I do think a chic pantsuit can make for the perfect #OOTN at a cocktail party or work soiree. Think pink for your next event! Such a classy, feminine and flawless work outfit! You're looking like a true girl boss in this combo! With this outfit you are ready for business! 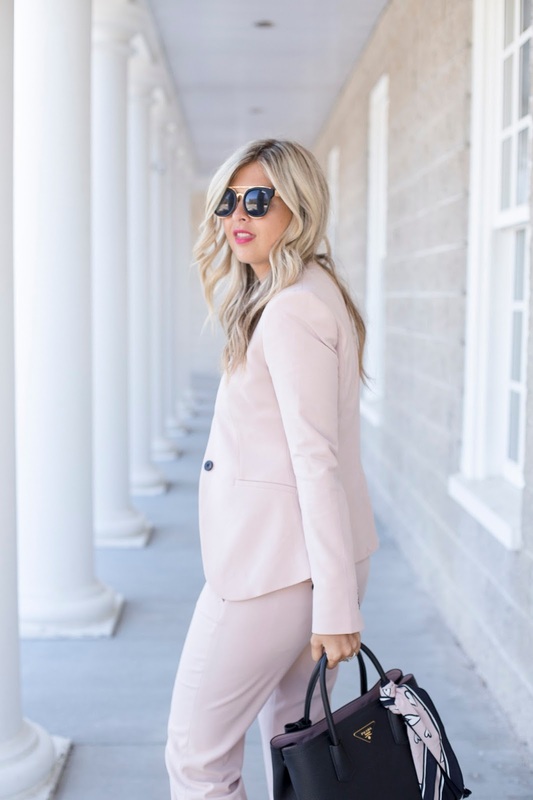 You look so fab in blush and in a power suit. So much love for this. Oh I love this look! Such a girl boss! What a lovely blush outfit, I love how you added some black accessories! In love with this suit. It is perfect. Gorgeous suit. I love your lip color!